More like 2 minute gratification, but that's pretty good ;). First four shots out of my Polaroid SLR 680 with the Edge Cut film I bought last week. I was terrified at first because I put the first pack of film in and nothing happened. The black card didn't eject. I couldn't release the shutter. I took the pack out and put it in a Polaroid OneStep that I got at a garage sale. The pack worked fine. However, I had never used it before and totally forgot you had to manually "focus" it. Needless to say, I kinda wasted that first shot but I guess the beauty of Polaroids is that even the mistakes can look kind of cool. I'll probably do a "messed up" Polaroid entry at some point. Anyway, continuing with my SLR dilemma, I calmed myself down and thought maybe it was just a dud and I put it in wrong or whatever. I tore open another box and nervously tried inserting it again. NADA. I looked through the viewfinder and it was all black. I figured the mirror was stuck, but I couldn't figure out how to knock it back into its right place. After a failed Google search for troubleshooting this problem, I fiddled around some more and have no idea what eventually did it, but something clicked and the black cover page came triumphantly out. Whew! I hated to shoot in the dim yellowy light of my room, but I couldn't possibly wait until morning, so I shot the one of my umbrella since it was such a nasty rainy night. I'm pretty impressed with the detail. You can see droplets of rain on it still! On the original at least. On the coneflower shot, I didn't even notice any defects that are probable in the Edge Cut film. Sweet. Ice cream truck in the background hehe. Whoops just realized this collage layout is the same as last post's. I need to get more creative at laying out my pictures. i love the way you arrange your pics. simple + clean. That's a pretty decent first-light set. Happy for you. 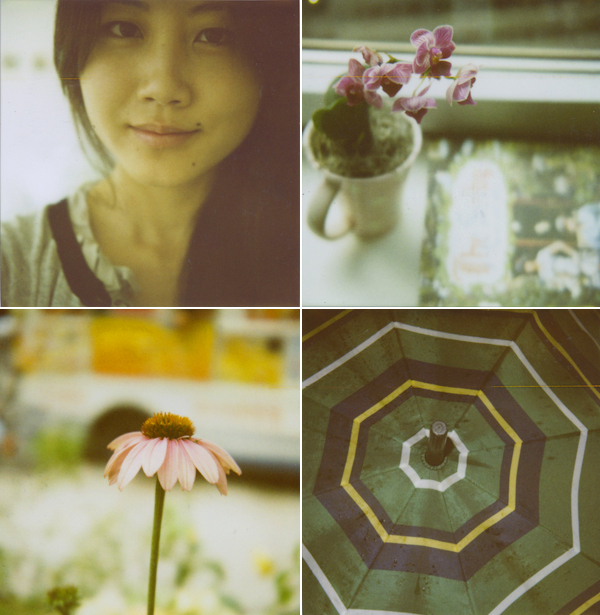 I seem to remember my Polaroids (from a looong time ago) having a green tint. Interesting, that streak; maybe it will be their version of "light-leaks?"